When I was growing up in central Arkansas, we had Beagle dogs for rabbit hunting and, of course, for instant affection and validation anytime, whether we wanted it or not. When I was 10 years old, my family re-located from our dairy farm in Cypress Valley to an equally rural area in the vicinity of Naylor, where we moved into a parsonage, located at the end of a dirt road off a dirt road; Daddy had received his very first assignment as a newly ordained Methodist minister. During our first Spring there, one of our Beagles gave birth to a litter of puppies, and we kept two of them for ourselves. 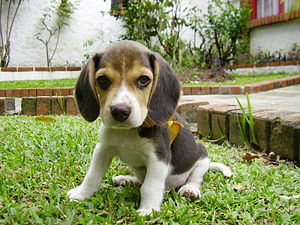 I luuuuuv Beagle puppies! They are so soft, so cute and so affectionate; and, so much fun to play with. Every school-day afternoon while the puppies were still quite small, I could hardly wait for the school bus to get to the end of our dirt road. I would spring off of the school bus and run all the way to our house so that I could spend the next half hour or so just playing with “my” precious little puppies. Of course, these little darlings seemed to always be hungry when I got home, and I liked nothing more than to bring out a small pitcher of milk and a couple of cereal bowls and settle down with the puppies in a patch of fresh green lawn beside the house. They would eagerly lap up all the milk in the bowl, and I would just as eagerly give them “seconds” just to watch them do it all over again. What fun! Well, one day I got an idea for what would turn out to be the very first of many biological experiments I would conduct over a long and successful career in biological research. I was pondering the gusto with which these innocent little biological units would scarf down all the milk in their bowls, including the “seconds”, and it occurred to me that it would be interesting to find out just how much milk they would drink if I provided an unending supply of it. Would they drink only until they were full, or would they just keep on drinking until they just couldn’t keep any more milk down? With an innocent curiosity and no malicious intent whatsoever (keep in mind that I was just an 11 year old boy and I really loved those little puppies), I resolved to find the answer to this monumental question. So, the next day I filled up the milk bowls once and then twice, and then I went where no boy had gone before (at least not to my knowledge); I filled the bowls yet a third time! To my surprise, these valiant troopers just kept on lapping up the milk and wagging their tails for more. After the third round of refills, I began to get a little worried, because now, the puppies were visibly swollen in the middle. Yet, they weren’t whining or whimpering yet, so I filled their bowls for a fourth time, determined to get the final answer to my seemingly innocent research question, but without inflicting any harm on the little guys. This time, I noticed that they were slowing down but still lapping and swallowing eagerly, and so I decided to take some additional, preliminary data on the progress of the experiment. With no little trepidation, I reached down and very gently squeezed their swollen bellies between my thumb and index finger to assess the degree of danger I might just possibly be exposing the thoroughly plumped puppies to. Their bellies were now tight as a drum, and this put a serious scare into me. Had I gone too far, already? Will they bust open right before my eyes? If they do bust open, how can I explain it to my parents so as to escape the punishment I so richly deserve for heartlessly murdering these tiny little helpless bundles of life just to conduct a silly scientific experiment? So, like a flash, I jerked away the milk bowls to minimize any further potential damage, and I was not prepared at all for what happened next. I observed that these two little puppies turned, in unison, to walk away, still lapping and swallowing as fast as they could, but now just to try and keep down the last of the milk that was dribbling out of their mouths. I observed also that they were breathing heavily and with great difficulty, because there was no room left in their little bodies for a lungful of air, thanks to their excessive intake of cow’s milk. And finally, I observed that their now-bloated bellies were actually dragging along the ground as they waddled slowly away. In some sort of sick way I suppose, this scene was to me both humorous to watch and scary to contemplate, at one and the same time. But, as I continued to keep my eye on them, it became apparent that they were, indeed, way too full, but not to the point of bodily harm. This realization enabled me to take a deep sigh of relief and get an, albeit somewhat sinister, little chuckle out of the entire affair, especially the ending. So, what is the answer to the big question: how much milk will Beagle puppies drink if they are given an unending supply? The answer is… just as much as they can possibly keep down with constant lapping and swallowing, once it starts to come back out as fast as it goes back in! Oh, and by the way, my parents never found out about this experiment. Hey, what they don’t know won’t hurt me, right? This entry was posted in True Tales and tagged Arkansas, Beagle, bellies, cruelty to animals, data, experiment, funny story, gluttony, Humor, humorous, milk, puppy, research, story, tale.